I am constantly striving to make my images better reflect the beauty and wonder of the natural world around me. People often ask me what camera settings I am using to take the photos that I take. To me that is missing most of the point. Of course it is nice to be able to take a picture that is correctly exposed and in focus, and without that, the image is less likely to reflect the natural beauty you are trying to convey. It is necessary, but not sufficient, to have a technically correct image. Much more important is how the image displays the subject in its environment. It is important to consider all the stuff that is in the frame but that in itself is not the subject – stuff like colour, light, shade, distractions, shadows, bright spots and so on. If it doesn’t enhance the subject of the image, then how can you alter the picture in some way so that it does. Most importantly, can it give the feeling that you get when you are viewing the subject. In short, you need to disengage the technical side of your brain and engage the artistic side and tie the image you are taking into the emotions you are feeling. What are you feeling and what is it about what you are seeing that makes you feel like that. What makes you gasp, draw your breath, say “Wow!”. I can’t claim to have mastered this, but these images give some idea of how I am thinking when I take a picture. 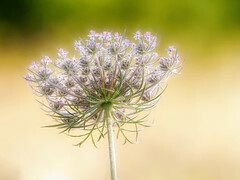 The first image (above) is wild carrot flower in our meadow. This is a plant that I love, so it was important to show not only the delicate nature of the plant, but also the way in which it blends so gracefully with the meadow. I did this by ensuring that the depth of field was sufficiently small to blur the background but not so narrow as to make it completely free from texture. There is the feeling here of something, and the angle of the shadows reflects the angle of the wild carrot plant, as if they are all moving in the same breeze. The lighting is warm evening light, and that was important, but the wild carrot itself stands out because I have placed it in front of an area of shadow. This image is of rosebay willow herb in our woods near sunset. I loved the way in which the sun picked out and backlit the flowers, making them seem lit up from the inside. However there were a lot of trees in the background which could have been very distracting, so I made sure the depth of field was very narrow, and this led to a nice circular bokeh. Placing the bright part of the flower by the bright part of the background really draws the eye to this part of the image. This little damselfly is perched on a reed stem by one of our ponds. I have many pictures of damselflies with a nice green background, but here I noticed that other plants in the background gave a variety of colours – green, yellow, red=brown and blue. By placing this out of focus, it looks as if I have applied a rainbow filter of some kind to the image – in fact this is a completely natural look. The only editing done here is the usual slight adjustment of the RAW image for white balance, noise, sharpness and minor tweaks to the exposure. Here my eye was drawn to the amazing sparkles on the pond behind the dragonfly. 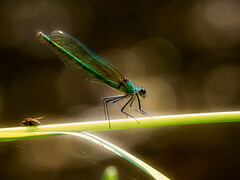 The dragonfly is perched on a fairly ordinary piece of dead reed stem, but the sparkles behind make it look like it is sitting in front of Christmas lights. It is a completely natural effect due to the way in which the image was taken. Sometimes pulling away from your subject makes it stand out more. This is a dragonfly perched on a reed stem at one of our ponds. What I have done here is make use of the backlighting to make it stand out, but also use the lovely patchwork of colour produced by the evening light on the foliage in the background to enhance the image further. It looks a bit like an impressionist painting. Again, this is a natural effect, with only minor routine editing of the RAW file. These aren’t perfect images by any means, just a set of pictures I took in the last week or two. I can criticise each of them. But I hope it illustrates what I am thinking when I take a picture, and how the background can make the difference between a pretty ordinary image and one that stands out a bit from the crowd. This entry was posted in Photography and tagged Art, background, Backlight, Camera, colours, dragonflies, insects, macro, Nature, Photography, technique. Bookmark the permalink. Thank you AJ, you are most kind. You’re photographs have a whimsical feel to them. They are beautiful and memorizing. Thank you for sharing. They have inspired me to get out and try something similar.